"Long-regarded as not much more than a a place to break the journey between Siem Reap and Phnom Penh, Kompong Thom is beginning to attract those who are able to recognise its charms as a real Cambodian market town and a staging post for two of the most gorgeous temple sites that Cambodia has to offer. For those longing to escape the crowds and madness of Cambodia�s main tourist attractions, yet keen to visit some spectacular locations, Kompong Thom might be just the ticket." Kampong Thom is a province of Cambodia. Its capital is Kampong Thom, a picturesque town on the banks of the Stung Saen river. Kampong Thom is one of the provinces that borders the Tonle Sap Great Lake. Although Kampong Thom Province has some important attractions to offer, it has not yet been exposed to mass tourism, preserving its unspoilt and authentic feel. Kampong Thom itself is a typical small Cambodian town, with a pleasant riverside and some beautiful French architecture. One unique feature of the town is its colony of over 700 bats. For a great photo-opportunity, look out for them in the cluster of trees near the provincial government building at around 5.30 pm to 6pm. Catch them flying off into the sunset. Some quirky landmarks are also worth a mention, such as the statue of an elephant stepping on a tiger � the town�s emblem. Another interesting statue is the well-preserved statue of the Rearing Lion, from the tenth century, which was brought to Kampong Thom from a jungle temple complex in Preah Vihear. Wat Kampong Pagoda (built in the twelfth century) is another of the town�s highlights. It features, among stupas and shrines, some strange-looking statues of monsters. A mural inside the main sanctuary was painted in 1960 and depicts Norodom Sihanouk surrounded by the world leaders of the time. Kampong Thom also boasts one of the country�s few churches not destroyed by the Khmer Rouge. Designed by Vann Molyvann, it is definitely worth a look. The grasslands and rice-fields surrounding Kompong Thom of an extreme importance for wildlife conservation. These areas hold the largest global population of the endangered Bustard the Bengal Florican as well as occasional large water birds from the Tonle Sap floodplain (Adjutants, Pelican, Painted Stork). Other species include large numbers of wintering pale arctic passerines (including Dusky Warbler, Yellow-breasted Bunting, Siberian Rubythroat) and the globally vulnerable Manchurian Reed Warbler. In March large numbers of Oriental Plover pass through the area making this possibly the best area in the world to see this species. The areas also offer a glimpse of everyday life in the Cambodian countryside with many fishermen, ox-carts and small scale farmers. The best way to visit the grasslands is by en-listing the help of a moto-dop driver from in-front of the Arunras guesthouse. A number of these know the area (around Rolous village about 5km towards Phnom Penh) and speak English. 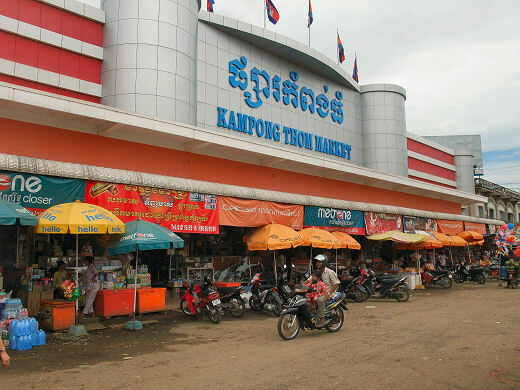 Kampong Pos Thom was the original name of the present called Kampong Thom. Because originally long time ago, at the dock of the Sen River next to a big natural lake, there was a big cave with a pair of big snakes inside. The people living around this area usually saw these big snakes every Buddhist Holiday. Time after that, the snakes disappeared, and the people of that area called it Kampong Pos Thom. Then, only short words Kampong Thom. During the French colony in Cambodia, the French ruled and divided Cambodian territory into provinces, and named them according to the spoken words of the people Kampong Thom Province. 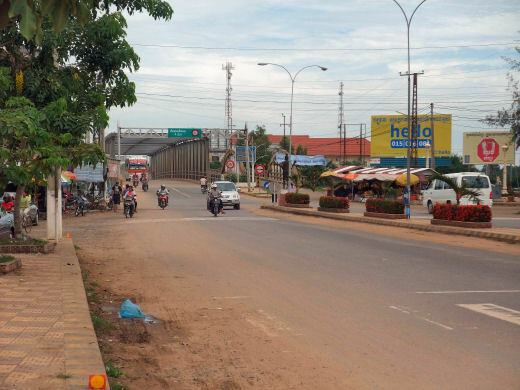 The provincial capital Kampong Thom is a bustling town on the banks of the Stung Sen River. 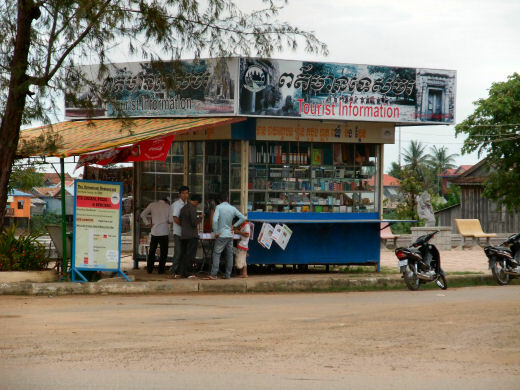 The town itself is strategically located on the National Highway No 6 between Phnom Penh and Siem Reap. Its more a stopover to have a break from driving long distances or to eat something on the way to Siem Reap or Phnom Penh, than a very touristic place. Despite the town itself people come to explore the pre-Angkorian Chenla capital Sambor Prei Kuk, the remote temples of Preah Khan and Prasat Preah Vihear.